The bombing of the BBC, blamed on dissident Irish republicans is the latest in a long line of attacks in England. The IRA has long regarded bombing English targets (there have never been any attacks in Scotland or Wales) as militarily and symbolically important, delivering a stark message to government and a propaganda boost to supporters. Following the IRA ceasefire, it seems dissident republicans opposed to the peace process are adopting similar tactics. The first IRA attacks on England came in 1939. But it was more than 30 years later in the aftermath of Bloody Sunday in 1972 that a new campaign began. The first bomb of the Troubles in England detonated at the Aldershot headquarters of the Parachute Regiment, whose soldiers had opened fired and killed 13 nationalist protesters in Londonderry. The Official IRA bomb killed seven - a gardener and the regiment's Roman Catholic padre - and five women in the kitchens. A year later, the Provisional IRA, now eclipsing the Officials, sent its first unit to London. The first and still one of the most infamous operations involved sisters Dolores and Marion Price and nine others who placed four car bombs in London on 8 March 1973. Ten of the team were apprehended as they attempted to leave Heathrow and two bombs were defused. But the remaining two, one of which was outside the Old Bailey, exploded, killing one man and injuring some 180 other people. Undeterred by the jailing of the Price sisters and others, the IRA regrouped its efforts. One of the most horrific bombings came in February 1974 when an IRA unit planted a bomb on a coach carrying servicemen and their families, killing 11 people. The bombing led to a controversial miscarriage of justice when Judith Ward, a woman with a history of mental illness, was jailed for that attack and others. Later that same year, an IRA unit planted bombs in two pubs in Guildford, Surrey. The explosions killed two soldiers, three ordinary people and injured 50 others. In November 1974, the IRA carried out one of its most devastating attacks when 21 people were killed in another pub bombing in Birmingham. As the public demand for justice put the police under pressure to get results, 10 people were arrested and jailed for both this latest incident and Guildford. But after long campaigns, the Guildford Four and the Birmingham Six were released in 1989 and 1991 respectively after the Court of Appeal found that they had been wrongly convicted. While these bombings led to this significant miscarriage of justice, it also prompted Parliament to introduce new anti-terrorism laws. The government won approval for powers to expel people from mainland Britain to Northern Ireland or the Republic while the police were given seven days to hold terrorism suspects without charge. 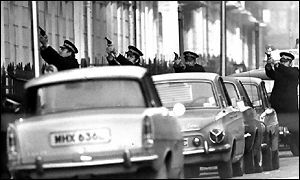 Following the collapse of the IRA's 1974-1975 ceasefire, a fresh campaign began, led by a four-man who became known as the "Balcombe Street Gang". Martin O'Connell, Edward Butler, Harry Duggan and Hugh Doherty carried out a wave of bombings detonating their first ten devices in just five days. The gang also killed Ross McWhirter, the co-editor of the Guinness Book of Records, after he had offered £50,000 for information leading to the arrest of the team. However, after a botched attack on a Mayfair restaurant, the four men took local residents hostage (in an apartment on Balcombe Street) and began a tense stand-off with the police. After six days, the four surrendered, providing a major victory to the security forces. The men were charged with 10 murders and 20 bombings and jailed for life. During the trial they claimed responsibility for the Guildford pub bombings and another incident in Woolwich, acts which were not added to the list of charges. In the late 1970s, the IRA reorganised into "cells" and placed small teams into England who, theoretically, could not compromise the whole movement if caught. While there appeared to be no end in sight to the violence in Northern Ireland, security forces in England recognised that the IRA had become increasingly sophisticated. Evidence revealed at the trials of bombers suggested that the IRA had built a sophisticated and extremely secure network of operatives and logistical teams. The most visible sign of this came with the 1984 Brighton bombing of the Conservative Party conference - the bomb had been planted in the hotel weeks in advance. Five people including the Conservative MP Sir Anthony Berry were killed. The wife of Norman Tebbit was left crippled, though Prime Minister Margaret Thatcher walked out of the wreckage without a scratch. Shortly afterwards, a statement from the Provisional IRA reminded the government that the republicans only had to be "lucky once". In some instances, neighbours of bombers brought to trial told how they had simply no suspicions of terrorist activity because they had led such an ordinary life. The IRA also chose to stretch its campaign in England and its definition of legitimate targets. In 1993, the IRA detonated the Warrington bomb which killed three-year-old Jonathan Ball and 12-year-old Tim Parry as they shopped with family and friends. A different attack on Warrington targeted gasometers. The IRA also shifted its focus more and more onto "economic targets", the most important being the City of London. Little over a month after Warrington, a bomb at Bishopsgate in the City killed one, injured 44 and caused at least £350m of damage. In propaganda terms, it was a massive boost to republican morale. The first consequence of the bomb was that the government threw what became known as a "ring of steel" around the City - roadblocks throughout the Square Mile. The second consequence of Bishopsgate and Warrington was to heighten a sense of fear in English cities over the capabilities of the IRA, just as had been the case in Northern Ireland's cities and towns for years. That fear subsided following the August 1994 cease-fire. Yet the IRA's return to bombing operations reminded the public how well organised it remained. At 7.01pm on 9 February 1996, the IRA ended its ceasefire with a massive bomb at London's Canary Wharf offices development, killing two men and causing at least £85m of damage. The IRA apparently chose to break its ceasefire in England rather than Northern Ireland, knowing that it would have far more impact on the government. As the prospects for some kind of political talks appeared fragile, the IRA bombed Manchester's Arndale Shopping Centre - injuring 200 people and creating so much damage that it took years to rebuild the area. While the Provisional IRA has been on ceasefire since 1997, the lessons of its England campaigns does not appear to have been lost on dissident republicans. The question now, however, is whether or not dissidents have the manpower, the expertise and the experience for a sustained campaign.